The lake looks like a trash can. Towards the island in the middle away from the trash dumped you will notice the migratory birds by the dozens. You will notice how we are destroying this beautiful lake which is like an oasis amidst all the concrete. The dumping on the other side of the flyover towards the BMTC depot stands out like a sore thumb. The yearly Ganesh festival is over for humans, but the toxic chemicals from the hundreds of idols dumped in one of the largest city lakes could cause irreversible damage to the lake’s bird and marine population. This magnificient lake has been reduced to a dirty pond. Sad to see. Apart from polluting the lake, there is no respect to God either. One will feel very sad to see idols in that state after having celebrated the festival so grandly. BBMP was collecting Ganeshas on festival day, but never immersed in any water. For lot of days, the tractor which collected Ganesha idols were lying on the road side near my home at Kattriguppe which is also the locality where Mayor of Bengaluru lives. People have to buy idols of size which can be easily dissolved in water using a Bucket at home and put the water to pots or trees. The Sankey Tank in Sadashiv Nagagar is perhaps an an exception. Picture 1. The immersion tank is isolated nicely from the main Tank. However I suspect sewage water is still flowing in to the tank!!! This problem is not limited to just india; this blind belief is carried out abroad too!! that is the shocking observation i have made. What a blind belief. It is shocking that some of the most educated and so called progressive people carry out a blind belief destroying nature. Not that i am a saint who is careful about the usage of plastics and other stuff harmful to nature but i at least make it a point to segregate it and throw it in the proper garbage container but i certainly don't carry out blind belief that defies all logic and scientific facts. would like to cover the story for my college production. hi, i am a trainee journalist a di would like cover this story for my college production. I would be grateful if you could give me an apoint so that i could meet and talk to you all about this issue. I mean anybody who has witnessed this problem and is willing to talk about it. I have a question about the annual Ganesh Visarjan in the pacific ocean off San Diego coast sponsored by Shri Mandir; the 2012 event being communicated in this link - http://www.shrimandir.net/shrimandir/Data/Sites/1/NewsletterAD/92012.pdf ; the question - Is the idol fully reclaimed from the water; brought back to land and disposed off in a proper manner or in fact reused for subsequent visarjans? I am hoping that the answer to my question is yes. Granted that most of us are NOT very judicious in the consumption and disposal of waste products (plastics, batteries etc.) that harm the environment (me included); but it is quiet surprising that in this day and age that educated professionals like us who are well travelled pursue a blind belief that defies common sense and scientific logic. This is a case in point where we are knowingly and wilfully harming the environment. Due to lack of regulation and civic sense large swathes of the country that we came from is being converted to toxic dumps, one example being Hebbal lake in Bangalore - http://www.bangaloremirror.com/article/1/201210042012100406254188067ad9065/Hundreds-of-uncleared-idols-spell-disaster-for-Hebbal-lake%E2%80%99s-biolife.html , do we want to accelerate that process in this country that most of us call home now? Even if the idol is reclaimed from the water, i would suggest not immersing the idol in the water at all in the first place due to the quesitonable chemicals that go into these idols and potentially can leach into the water. OR in fact it can be any cylindrical plastic drum OR it can be a new unused garbage can purchased from home depot. If you are interested i am willing to make a contribution to the temple solely for this purpose of making an environmentally friendly visarjan. We are discussing cleanliness and not beliefs here! Why do you think it is associated with only Ganesh Chaturti and then blaming it as blind belief? Understand that all beliefs are blind. So, if you want to discuss the menace of garbage/plastic, please discuss that only. Please be subective and don't drag this into unnecessary discussions. The problem is not Ganesh Chaturthi. The problem is the attitude of the people. During Ganesh Chaturti you will get to see it, that's all. Goto any tourist place in Karnataka. Do you see cleanliness? Aren't we use and throw plastic at our will? Don't say that, I am not doing it. The problem is not about the individual. It is about the society, it is about the attitude of the people. Just because people throw plastic at tourist places, you cannot call it "blind belief" or with some other name. The problem won't go away. The solution is to educate the people, teach them to live in hormony with the environment. Tell them the problems of plastic and the problem of throwing garbage at all the places. Show them what is right and what is wrong. Our education system teaches Maths, Science and gives more than necessary prominence to these subjects. But, we never teach our youngsters about cleanliness, about environment & ecosystem, about ethics. Even though there is a subject called Moral Science, it is not considered as an important subject! So, how do you expect the people to learn everything by themselves? Just by writing to some authorities, writing in blogs, blaming the people, blaming the beliefs is not going to take you anywhere. Talk about solutions. Talk about solutions that is simple and appealing. Talk about solutions, which will have long lasting effects. >>Why do you think it is associated with only Ganesh Chaturti and then blaming it as blind belief? I have not made any claim that this is associated only with Ganesh chaturti. I have only stuck to the topic of the original post; so please read the original post and my post carefully. And, i do stand by my statement of saying this is a blind belief, if you don't like what i have said, sorry, bad luck for you. >>Understand that all beliefs are blind. So, if you want to discuss the menace of garbage/plastic, please discuss that only. Please be subective and don't >>drag this into unnecessary discussions. First off, unless you are the moderator who is laying down the rules here and enforcing it please don't tell others what to do on this forum. I am game if you are giving constructive ideas and a fact based discussion. I have been 100% subjective here and given constructive suggesions with an echo friendly alternative. Other than telling me what to do you have not offered ONE constructive suggestion and alternative here. >>just by writing to some authorities, writing in blogs, blaming the people, blaming the beliefs is not going to take you anywhere. >>Talk about solutions. Talk about solutions that is simple and appealing. Talk about solutions, which will have long lasting effects. Forget about where my actions are taking me... Is your post taking us(praja folks) anywhere? I definitely don't think so. Do you have any positive suggestion and solution to improve upon the problem stated in the original post? I definitely have given a solution that folks can in fact start implementing in their homes and temples..are you willing to volunteer to help implement that (this goes back to the blind belief thing, why does the immersion have to be a public lake, why not a bucket at home?)? Probably the offending phrase “Blind Belief” needs to be edited. Instead, thinking positively about the Indian sweets and savories during Ganesh festival, would yield better result. Similarly during Christmas, End of Ramzan Fast the festivities. Immersion of Ganesh idols is causing problem because of the prohibited environment unfriendly colors being used. Our government is trying hard to remedy this aberration. We have stopped buying colored idols, for this very same reason long back. The actions taken by you are commendable. When blpraj is talking of 'blind belief', he is not talking about celebration of Ganesh Pooja per se. He is talking about the blind beliefs that the idols should be immersed only in lakes, that they should be mammoth-sized, besides being painted in all kinds of colours using lead-based paints, etc, all of which are leading to huge environmental damage. And, neither is he saying that the environmental damages are limited to Ganesh Pooja alone. More than blind belief, I believe that these are resulting out competitive religiosity. So, if one community celebrates a festival with great fervour in a year, the other community lot want to do theirs even bigger. If only they could all compete with each other in doing more of community work, the world would perhaps be a lot better place for all concerned. In your comment addressed to me, you have told: "I have not made any claim that this is associated only with Ganesh chaturti." In your original comment, you had written: "this blind belief is carried out". So, while talking about pollution created during Ganesh Chaturti, which belief are you calling as blind? Who are you to call a belief as blind or not? And how is it related to environment pollution? During Ganesh Chaturti celebrations, the lakes are getting polluted and there is no denying about that. But, don't use this to call a belief as blind. And your question that, "Do you have any positive suggestion and solution to improve upon the problem stated in the original post? ", just proves that you comment without reading posts. Anybody who reads my comment above (assuming that the person knows English) will make out the suggestions I have made. It would have been wiser, if you had told that my suggestions or solutions don't make sense or they are not practicle. But, instead you are alleging that I didn't give any positive suggestions or solutions. Please don't allow your "anger" to blind you. I can only say to people, just stop dumping idols in lakes of your whims & fancy please. 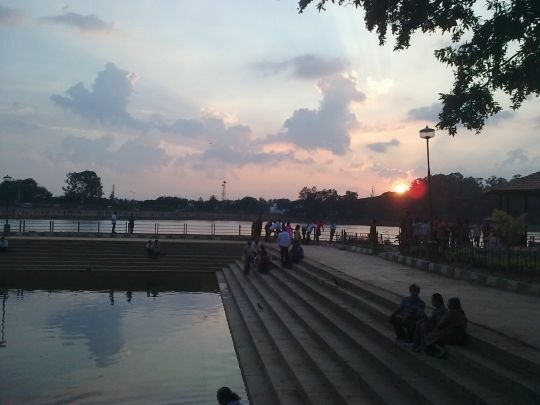 Immersion of idols in Hebbal lake was banned because it did not have an isolated immersion area. Sankey tank has one & the immersion tank will be cleaned once the immersions are over. Govt needs to investigate how this was allowed in Hebbal in the first place. The debris stuck on the Hebbal lakeshore was of mammoth painted ganeshas & associated wood & other paraphernalia. Just looked like a trash can. If only the fishes & birds could come & crap in our houses we will know how it feels. Thanks. You are bang on target in your assesment which i made clear in my last line in the 2nd post. In fact there is another very simple solution for this (specific to what is discussed in the starting post) if we are willing to change our ways. There is this concept of "sakkare acchu" which we are used to during Sankranti. Why not make ganesh idols out of it? All it takes is sugar and a couple of hours at the most. The end product is so biodegradable and it does not matter whether it dissolves at home in a bucket or in a public lake (of course, i will let the scientific community speak on the ill effects of too much sugar being introduced into the lakes so that they can provide the final recommendation. But the advantage with this approach is that we don't have to deal with paint etc. since we really cannot enforce the commercial constructions of idols on a mass scale and how biodegradable they are). But, bottom line is; the photograph that was shown in the article referenced in the original post is a result of people's actions AND lax law enforcement AND awareness. Some folks have questoned why I am saying this is limited to ganesh chaturti; well, i am just sticking to the topic of the original post. Feel free to start a thread on diwali and i will start talking on that topic. Also, on threads related to plastic and garbage i have responded with my views.